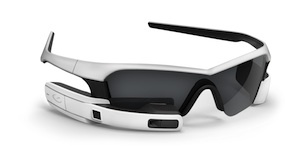 Recon Instruments' new wearable computing device. Image courtesy of Jet press kit. Look out, Glass—competition is heating up. 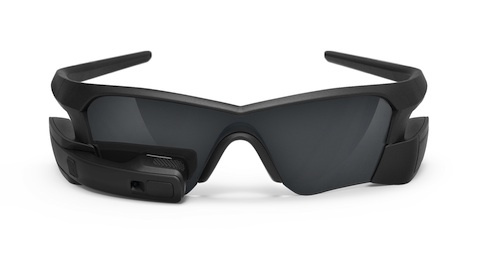 Recon Instruments unveiled Jet, a new heads-up display, at this year's Google I/O developer conference, introducing a sporty new addition to the nascent commercial market for wearable computing. Jet boasts of its "perfect balance." Image courtesy of Jet press kit. Following the success of Google's Glass Explorer program, Recon has launched its own Twitter-based application process for those interested in being among the first to procure the device. The cleverly-named "Jet Pilot Program" features the hashtag #SeeTheFuture and offers participants the chance to "win Recon Jet," although it is unclear whether winners would be asked to purchase the product like those selected by Google's #ifihadglass campaign. Although Google has garnered much publicity this year with the release of its Glass Explorer device to a limited number of early adopters, Recon is no mere upstart; its first product, designed for snow sports, was released three years ago. According to a press release, Jet is a "faster, smaller, and more powerful new platform" that features an impressive array of gear, including "a dual core processor, dedicated graphics, Wi-Fi, ANT+, Bluetooth, GPS, HD camera, and a comprehensive suite of sensors. "A video on the Jet website indicates that an accelerometer, gyroscope, altimeter, magnetometer, and thermometer are all packed into the 60-gram device. Jet is also available in a white model. Outdoor enthusiasts appear to be Recon's target demographic. Its press release refers to the Vancouver-based company as "a world leader in Heads-up Display (HUD) technology for sports and activity-specific environments," and the Jet video highlights users engaged in a variety of athletic activities: running, biking, skiing, and golfing. The site does not indicate whether the device may be operated indoors without the sunglasses component, but a brief segment of the marketing film features the technology being used by surgeons in an operating room. How the public will respond to the eventual commercial release of such heads-up, wearable computing products later this year is a matter of great speculation. One thing's for certain: Google is not the only company hoping that augmented reality products take off in the near future. I'm won of those that "Won a Jet" but am waiting to hear on the details. This is the last bit of a quote from Recon: "we will be in touch with details when Recon Jet begins shipping, which will be before the end of this year! Again, congratulations and we hope you're excited about Recon Jet as we are!" Just waiting since it seems unclear although they keep saying "you won" which is a bit different than Google (I'm a Glass Explorer too). Should be interesting! "one of these" - hah, I got lost in the syntax! It does seem that, from their wording, your Jet should be free -- it looks like the tradeoff is that fewer people are being selected. It will be quite interesting to have both Glass and Jet--congratulations! Augmented Me is a blog about cyberculture written by a Google Glass Explorer. Comments, queries, suggestions, praise, criticism, feedback, insights, quips, and deep philosophical musings are welcome. 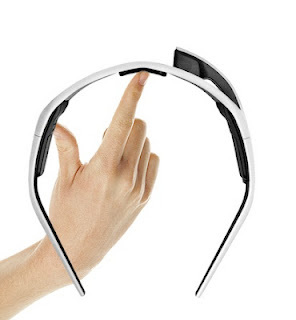 Kevin P. Trovini is a digital technology enthusiast and Google Glass Explorer.